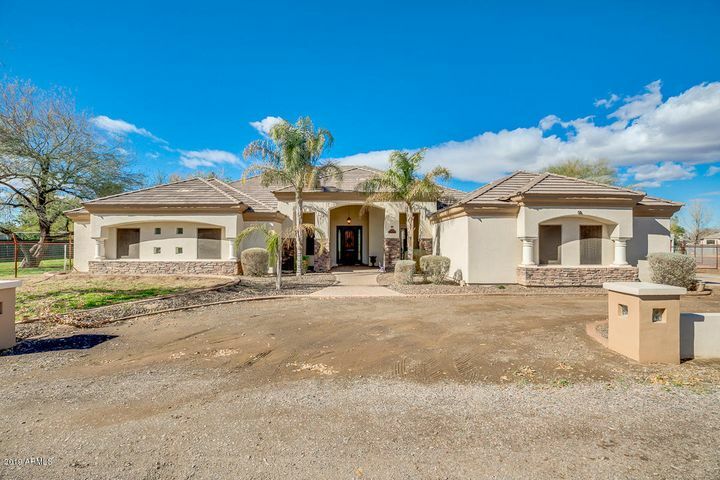 Horse Property In Gilbert! A picture perfect custom single level home is now available and priced to sell. Gracious living at its finest! Featuring 3700+sf with an open floorplan concept,4 bed, 2.5 bath, office, living/dining room, neutral tile/carpet, plantation shutters, gorgeous fireplace in family room. Gourmet kitchen boasts recessed/pendant lighting, center island w/ breakfast bar, granite counters, ample cabinetry w/ crown molding, pantry, sparkling stainless steel appliances. The master suite has a private exit, sitting area, full bath with dual sinks, garden tub, step-in shower, walk-in closet. The backyard includes an extended covered patio, fire-pit, storage shed, horse corral/stall. The front yard offers low maintenance landscaping and a 3 car garage. This is a must see! © 2019 Arizona Regional Multiple Listing Service, Inc. All rights reserved. The data relating to real estate for sale on this website comes in part from the Arizona Regional Multiple Listing Service. Real estate listings held by brokerage firms other than Phoenix Urban Spaces, LLC are marked with the Arizona Regional Multiple Listing Service logo and detailed information about them includes the name of the listing brokers. All information should be verified by the recipient and none is guaranteed as accurate by ARMLS. All properties are subject to prior sale, change or withdrawal. Neither listing broker(s) nor Phoenix Urban Spaces, LLC shall be responsible for any typographical errors, misinformation, misprints and shall be held totally harmless. Listing courtesy of Homesmart. Listing data last updated Wednesday, April 24th, 2019 02:28:06 AM.